Tracklisting 01 . The Mitchells - Right On, Right Now! 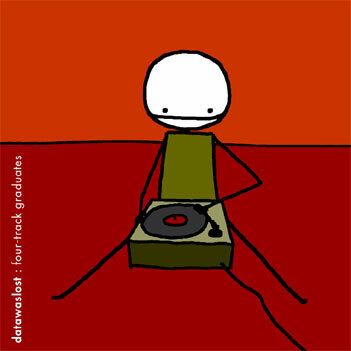 Datawaslost : The Four-track Graduates (2001 Indiepop Compilation) DWL008 . Released January 2001 . Out of Print Description Our first compilation, a lo-fi grab bag of indiepop and electro sounds featuring exclusive tracks from Haleymill, Aphid, Compiler, & Protein Summer. Only 100 were pressed, making it a bit hard to find today. Artwork by Sam Brown of Exploding Dog - please visit his site and buy a book, they're wonderful. Reviews Graduates kicks off with The Mitchells' Kinks-ish 'Right On, Right Now,' Haleymill's anthematic 'Things You Do,' and Structure Factor 8's hissing, bratty 'Hutch,' which are based in a sort of retro-Pop feel, mixing hooky melodies with a garagey, upbeat approach. But the further you get into the compilation, the clearer it becomes that the only thing all of these artists have in common is their homemade recording approach. DJ Aphid provides the off-beat Folk Hop collage 'Jazzercising Women Remix,' Coltrane Motion incorporate keys and samples into the more ambient 'Slow Down Brother,' and Compiler's 'Futura Heartbreak' mixes acoustic guitars and distorto-vocals. Elsewhere, The Throbs add a little Punk to the proceedings with their frenetic 'Anything Right Now,' and Post-Haste's 'Ugli Fountains' is quite simply a great, fuzzed-out Pop tune.